Ray Seyfarth, "Introduction to 64 Bit Intel Assembly Language Programming for Linux"
This book is an assembly language programming textbook introducing programmers to 64 bit Intel assembly language. The book is intended as a first assembly language book for programmers experienced in high level programming in a language like C or C++. The assembly programming is performed using the yasm assembler (much like the nasm assembler) under the Linux operating system. 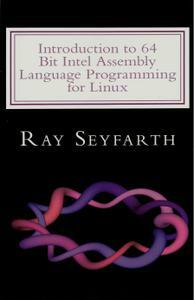 The book primarily teaches how to write assembly code compatible with C programs. The reader will learn to call C functions from assembly language and to call assembly functions from C in addition to writing complete programs in assembly language. The gcc compiler is used for C programming. The book starts early emphasizing using the gdb debugger to debug programs. Being able to single-step assembly programs is critical in learning assembly programming. Highlights of the book include doing input/output programming using the Linux system calls and the C library, implementing data structures in assembly language and high performance assembly language programming. A companion web site has a collection of PDF slides which instructors can use for in-class presentations and source code for sample programs. Early chapters of the book rely on using the debugger to observe program behavior. After a chapter on functions, the user is prepared to use printf and scanf from the C library to perform I/O. The chapter on data structures covers singly linked lists, doubly linked circular lists, hash tables and binary trees. Test programs are presented for all these data structures. There is a chapter on optimization techniques and 3 chapters on specific optimizations. One chapter covers how to efficiently count the 1 bits in an array with the most efficient version using the recently-introduced popcnt instruction. Another chapter covers using SSE instructions to create an efficient implementation of the Sobel filtering algorithm. The final high performance programming chapter discusses computing correlation between data in 2 arrays. There is an AVX implementation which achieves 20.5 GFLOPs on a single core of a Core i7 CPU.